For other people named Richard Olney, see Richard Olney (disambiguation). 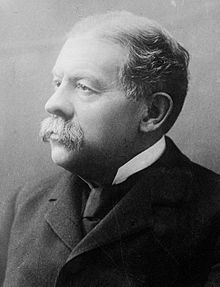 Richard Olney (September 15, 1835 – April 8, 1917) was an American statesman. He served as United States Attorney General and Secretary of State under President Grover Cleveland, and in the latter position, briefly, under Cleveland's successor, William McKinley. As attorney general, Olney used injunctions against striking workers in the Pullman strike, setting a precedent, and advised the use of federal troops, when legal means failed to control the strikers. As secretary of state, he raised the status of America in the world by elevating U.S. diplomatic posts to the status of embassy. During the 1894 Pullman strike, Olney instructed the district attorneys to secure from the Federal Courts writs of injunction against striking railroad employees, setting a precedent for "government by injunction". He ordered the Chicago district attorney to convene a grand jury to find cause to indict Eugene Debs and other labor leaders and sent federal marshals to protect rail traffic, ordering 150 marshals deputized in Helena, Montana alone. When the legal measures failed, he advised President Cleveland to send Federal troops to Chicago to quell the strike, over the objections of the governor of Illinois. Olney argued that the government must prevent interference with its mails and with the general railway transportation between the states. Wikisource has the text of the 1911 Encyclopædia Britannica article Olney, Richard. This article incorporates text from a publication now in the public domain: Chisholm, Hugh, ed. (1911). "Olney, Richard" . Encyclopædia Britannica. 20 (11th ed.). Cambridge University Press. p. 91. ^ Schlup, Leonard C.; Ryan, James Gilbert (2003). Historical Dictionary of the Gilded Age. M.E. Sharpe. p. 344. ISBN 9780765621061. Retrieved 30 November 2017. Grenville, John A. S. and George Berkeley Young. Politics, Strategy, and American Diplomacy: Studies in Foreign Policy, 1873-1917 (1966) pp 158-78 on "Grover Cleveland, Richard only, and the Venezuelan crisis"